Chester Nimitz was selected as Commander in Chief of the United States Pacific Fleet just after the attack on Pearl Harbour. He took command and quickly organised his outnumbered forces to halt the Japanese advance. As ships, men and aircraft became available, Nimitz shifted to the offensive and drove the Japanese forces back across the Pacific in one hard fought battle after another. 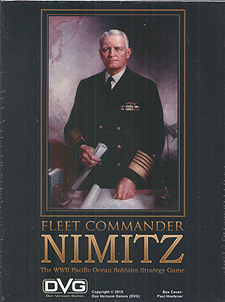 Fleet Commander Nimitz includes 4 historical campaigns: 1942, 1943, 1944 and 1945. Each campaign features a unique set of Ship, Land-Based Aircraft, and Infantry counters with combat values accurate for that campaign. In each campaign, you move your forces, engage in detailed battles, and march across the Pacific to victory! Your decisions create an endless variety of outcomes, which makes each campaign infinitely replayable. Your decisions directly affect the Allied campaign to defeat Japan. You can also link your campaigns to play through the entire war in the Pacific. Fleet Commander Nimitz is a Solitaire Game. You are placed in command of the US's Pacific forces and make historically appropriate decisions, while the built-in game system controls the Japanese forces. This means you can play the game at your own pace, whenever and wherever you choose.